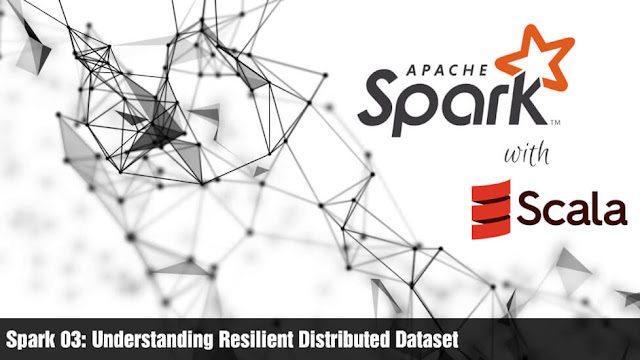 As the name suggests, Resilient Distributed Dataset is a distributed dataset by nature which means you can safely distribute RDDs across nodes and execute operations on them. This property of RDD solves the problem of expensive remote access of data in distributed computing because an RDD can be migrated to a node which is depending on the data stored in that RDD. Another property of RDD is its ability to recover quickly (Resilient) which comes with an additional requirement: Immutability. When we write a Spark program, we are creating a directed acyclic graph which generates an RDD after every transform operations. In this code, the sc.textFile function creates the first RDD (referred by the variable data) of String. The next Transformation operation filter creates a new RDD (referred by te variable filteredData). Similarly, the map is another Transformation operation which creates another RDD. Finally, the countByValue is an Action operation which gets the number of occurrences of each rating and returns it as a Scala object. The directed acyclic graph of RDDs created in the above code is shown in the following diagram. The important point to notice here is that none of these Spark operations modify an existing RDD. Instead, they create a new RDD. This behavior is known as immutability of RDD. Immutabe RDDs allow Spark to rebuild an RDD from the previous RDD in the pipeline if there is a failure. For example, in the above pipeline, if the filteredData RDD is failed for some reason, it can be rebuilt by applying the same filter operation on the previous RDD: data. If RDDs are mutable there is no guarantee that the data RDD will be in the same form as it was at the first time Spark called the filter operation on it. By being immutable and resilient, RDD handles the failure of nodes in a distributed environment. RDDs are type-safe similar to arrays in Java. In the example provided in the last section, the data RDD and the filteredData RDD are RDDs with the type of String. Therefore, you can perform only String related operations on those RDDs. Similarly, ratingData RDD is a Float type RDD so that you can operate Float related operations on that RDD. It helps developers to avoid runtime errors which are hard to track in a distributed runtime. RDDs support two types of operations: Transformation operation and Action operation. Transformation operations create new RDD from another RDD without modifying them (because RDDs are immutable). The following table lists some of the common transformations supported by Spark. Iterator<T> => Iterator<U> when running on an RDD of type T.
the partition, so func must be of type (Int, Iterator<T>) => Iterator<U> when running on an RDD of type T.
Note: By default, the level of parallelism in the output depends on the number of partitions of the parent RDD. You can pass an optional numPartitions argument to set a different number of tasks. join(otherDataset, [numPartitions]) When called on datasets of type (K, V) and (K, W), returns a dataset of (K, (V, W)) pairs with all pairs of elements for each key. Outer joins are supported through leftOuterJoin, rightOuterJoin, and fullOuterJoin. process's stdin and lines output to its stdout are returned as an RDD of strings. after filtering down a large dataset. repartition(numPartitions) Reshuffle the data in the RDD randomly to create either more or fewer partitions and balance it across them. This always shuffles all data over the network. each partition because it can push the sorting down into the shuffle machinery. Action operations are used at the end of a Spark pipeline to get Scala (or whatever the language you use) object from the final RDD. A Spark program never executes until an action operation is called on the last RDD. This behavior is known as lazy execution and commonly observed in other pipeline architectures including Java Stream API. By being lazy, RDDs avoid wasting the computing power for unwanted transformations. The following table lists some of the common actions supported by Spark. available on types that are implicitly convertible to Writable (Spark includes conversions for basic types like Int, Double, String, etc). saveAsObjectFile(path) Write the elements of the dataset in a simple format using Java serialization, which can then be loaded using SparkContext.objectFile(). Note: modifying variables other than Accumulators outside of the foreach() may result in undefined behavior. As a Spark developer, always remember that until you call an Action operation on an RDD, your Spark cluster will not do anything for you. For example, if you print the ratingData as shown below instead of calling the countByValue action method, you will get an output saying that you are printing an RDD not the list of ratings. Though an RDD may looks like a local variable in your code, at the runtime it can be shared across a cluster of nodes. If you like to learn more about RDDs, please check the research paper titled Resilient Distributed Datasets: A Fault Tolerant Abstraction for In-Memory Cluster Computing.